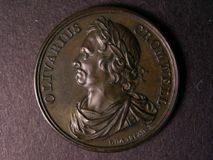 906 George II Memorial medal 1760 by Dassier, bronze, 41mm., (Eimer 681). EF. 1232 William Pulteney 1744, by J.A. Dassier, bronze, 55mm., obv. bust right, rev. COMES DE BATH MDCCXLIV within wreath. (Eimer 585). GVF.